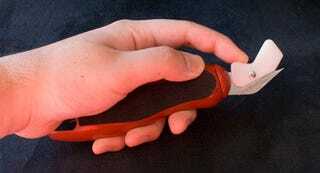 The Gadget: The Plastic Surgeon, a cutting tool to open those plastic blister packs that dominate retail packaging. It's shaped sort of like an old-school can opener (the non-turning kind), and is designed to rip the tip off of clamshell packs by slicing all the way around. p.s. the Plastic Surgeon doesn't come in a blister pack. It's got a paper backing that you slide off. Think toothbrushes.